Can Too Much Gluten Lead to Memory Loss? Gluten: Friend or foe? This question is hotly debated among both healthcare professionals and the general public. Amid all the controversy, mounting evidence is rising that suggests gluten could be linked to memory loss. With an aging population increasingly facing dementia, Alzheimer’s disease, and Parkinson’s disease, gluten may provide a key to unlocking these incurable conditions. A recent study at UCLA found that “eliminating all simple carbohydrates, gluten and processed food from [the] diet, and eating more vegetables, fruits and non-farmed fish,” along with other therapeutic lifestyle changes had a vastly positive effect on 9 out of 10 patients studied. 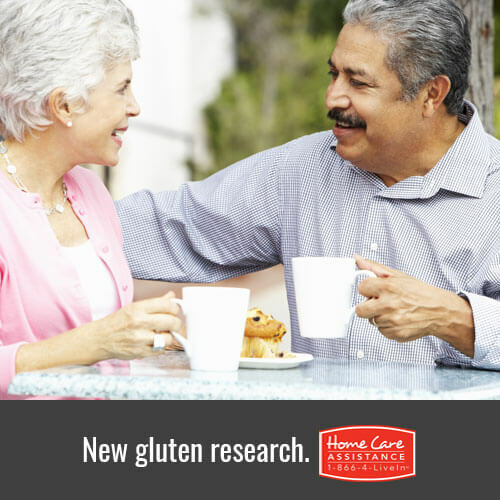 Many Albuquerque senior care experts also agree that eliminating gluten and changing other lifestyle habits has a positive effect on overall health. What remains to be widely accepted is the notion that eliminating gluten itself, apart from any other changes, aids in the treatment of memory loss. Because gluten has clearly been shown to affect cognitive function in those with celiac disease, it’s not too far off to propose that it could be linked to memory conditions and other neurological diseases. Dr. David Perlmutter, author of the widely read book Grain Brain: The surprising truth about wheat, carbs, and sugar; your brain’s silent killers, states that “Inflammation is the cornerstone of Alzheimer’s disease and Parkinson’s, multiple sclerosis — all of the neurodegenerative diseases are really predicated on inflammation.” Gluten can cause inflammation, and it’s possible that this inflammation leads to or encourages memory disorders. Dr. Perlmutter takes the theory a step further and advocates a diet free of all grains and simple sugars. Ultimately, his approach aims to eliminate sources of inflammation that damage the brain. Diets containing gluten may give way to memory conditions such as Alzheimer’s, Parkinson’s and dementia. Whether or not gluten is a cause, contributor, or trigger to these and other memory disorders remains unclear to medical professionals. However, positive results have been recorded from studies including gluten elimination as part of treatment protocol, and many people have had a great reduction or reversal of symptoms by following a gluten-free diet. For more information on promoting senior health and wellness, reach out to Home Care Assistance. As part of our mission to change the way the world ages, all care services include the Cognitive Therapeutics Method, which uses mentally stimulating activities to delay or slow symptoms of dementia and other cognitive conditions. To learn more about CTM or our specialized Alzheimer’s, dementia, or post-stroke care in Albuquerque, please call us at 505-798-0800 and speak with a friendly Care Manager today.